Planting crops in late July probably wasn’t the best for achieving a big harvest, but it was what I could manage this season. 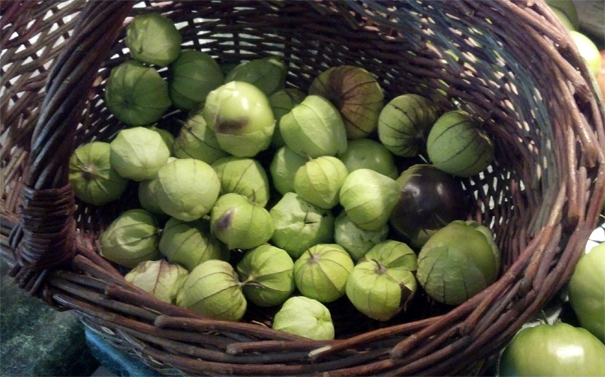 We did grow enough purple tomatillos to make a good batch of green salsa for a dinner or two. 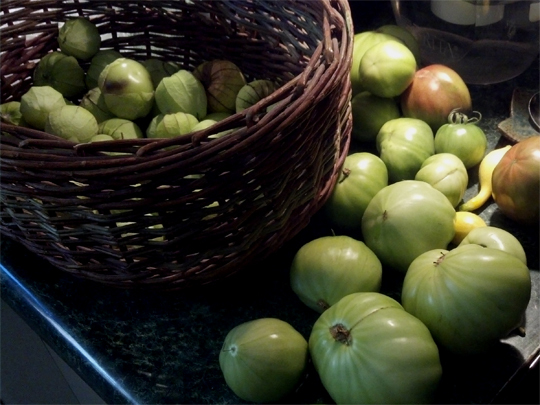 Green tomatoes might also become something tasty. The Black Krum heirlooms really didn’t do well but I continue to munch on Sweet 100’s when watering the garden. Temps have dipped to 30 degrees at night and the squash leaves have gone black and shriveled. Only two little yellow crook necks were harvested and a couple of zucchini remain on the plants to see if they will grow a tad more. One lemon cucumber is now larger than a walnut shell. Peas are still blooming and producing well. Maybe we’ll finally receive a little rain by the weekend. We’ve been without for months. I don’t count the showers that fell on September 21 as real rain.